I hadn't originally planned on camping at the Army Corps of Engineering's Pittsburg Park it ended up being a "Plan B" after my intent to camp at the city park in the nearby town of Weaubleau City. I've found that sometimes cities change their camping policy at their city parks and, as in the case of tiny Weaubleau City, no one corrects the website info so people like me don't get "the Word" until you actually physically visit and evaluate the site. So after a city employee at Weaubleau City broke the news that camping wasn't allowed in their park to me I hurriedly found the listing for Pittsburg Park and drove the half hour east to get to it. Pom de Terre is French and means "Earth Apple" or potato in English. 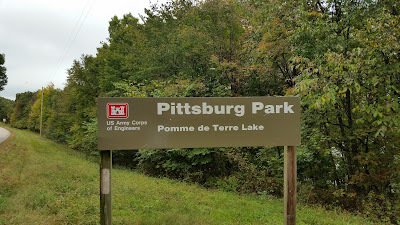 The Corps of Engineers constructed the park on the southern shore of Pom de Terre Lake on a circular peninsula that extends out into the lake. There is another portion of the park called the Hermitage which lies on the north shore of the lake. The lake is a part of a chain of lakes set up by the Corps as flood control for the central-southwest Missouri area. As I drove around the park's loop upon getting there I noticed that most of the campsites were on uneven ground that slanted somewhat sharply towards the lake. 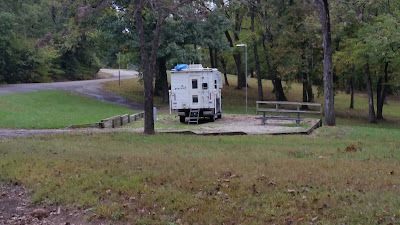 On my initial pass-thru I identified a single level campsite that was the unoccupied camp host's site (this was in mid-October, the camp host probably left in September) so I gratefully occupied the one level site I found in the entire park. There were full hookups at the site but both the electricity and water had been shut-off but it was relatively open to the sun so the Tank's solar setup could supply the power and it's fresh water tank was full. The Tank poaching the camp-host site. 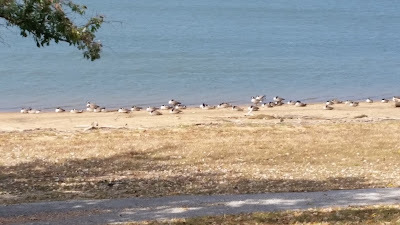 Geese resting on the lake shore before continuing south for the winter. I enjoyed the quiet at Pittsburg Park so much I extended my stay there for three days from my originally planned overnight. During the three days it was obvious by the boat launch traffic Pom de Terre Lake is a very popular fishing spot with the local population. I spoke to one of the fisherman and he said the lake is pretty famous for muskie fishing and to a lesser extent large mouth bass fishing. 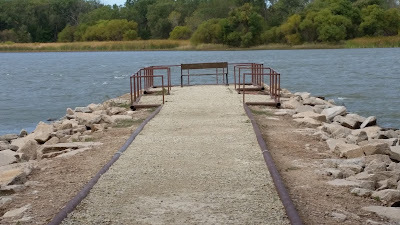 Fishing pier on Pom de Terre Lake. Army Corps of Engineer parks are always well kept and typically the campsites within them are clearly marked out and leveled. Pittsburg Park is an exception to the "level" part and some rigs might have trouble getting level enough that the refrigerator operates efficiently (I can notice the Tank's fridge laboring if the Tank is even a few degrees off level) but if level sites aren't a big deal the fishing and water sports presented justify a stay there.